These are the ten basic tools needed for electrical work. This list is especially handy for home owners or electricians for light-duty, basic electrician duties. The best quality electrician’s pouches are made of leather for durability and comfort. The pouch needs to be able to carry a variety of tools around the electrician’s waist and within handy reach while working. A single belt and single pouch should be enough to carry all the essentials for electrical repairs and maintenance. Any basic framing hammer will do. You want a straight-clawed hammer for prying open electrical boxes, which can be hard to open if they are metal or have been closed for long periods of time. You will definitely need a dedicated Philips number 1 and 2, or a combination Philips and flathead screwdriver set. The screwdrivers with the interchangeable Philips/flatheads are the most versatile, and you only have to carry one handle instead of two individual screwdrivers. An all-purpose utility knife is good to have on-hand for general cutting purposes. A utility knife with replaceable blades is preferable. Extra blades either come in their own hard plastic case, which is small enough to carry in your tool belt/pouch, or they store in the handle of the knife. Utility knives are used for cutting wire, insulation, scoring sheet rock, and other types of cutting. A dedicated wire-stripping tool is one of the most often-used tools in an electrician’s tool supply. You want a wire-stripping tool to have insulated handles to protect you from shock, and be able to strip all different gauges of wire. You also want one with a cutting tool that can make cuts and create fish hook bends in wire when necessary. Electricians need electrical pliers for heavier duty cutting and pulling nails, or any type of gripping that is too small or too deep for your fingers to grasp. Electrical pliers are especially handy if you are wearing gloves; they add strength and dexterity to your grip when you need it. There are times when you need to mark where you are working or measurements when you need to drill or make a cut. A pencil will make a temporary mark, whereas a Sharpie may be needed to show up better on a painted surface or on the wires themselves. It is handy to have both. Dikes, also known as diagonal cutting pliers, are used for cutting and general use when cutting heavier wiring and surrounding materials. Usually a 12’ tape measure is long enough for most electrical jobs. 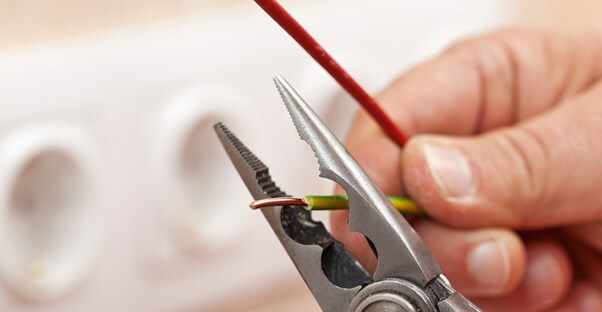 You need a way to ensure that there is no electrical current, or that the power is not running through the circuit, before working with electrical wiring. The lights on this tool indicate whether the circuit is on or off and is imperative to safely working with electricity. The fault indicator is what building inspectors all carry. It is another way to check your work. Plug it into any receptacle to check that the wiring is correct.